monthly benefit initially in effect (maximum of 40% of the original monthly benefit.) As your income changes, reassess your disability income needs. Make sure you are adequately protecting one of your most important assets: your ability to earn an income. The Long Term Disability program provides important Medical Specialty Definition of Total Disability! You may apply for up to $10,000 per month if you are under age 50. Members ages 50 – 59 may apply for up to $6,000 per month. Call a Marsh Client Service Representative for more information at 800-842-3761, e-mail CMACounty.Insurance@marsh.com, or visit www.MarshAffinity.com. © 2008 Seabury & Smith Insurance Program Management • CA License #0633005 • 9/08 777 S. Figueroa St., Los Angeles, CA 90017 • 800-842-3761 • CMACounty.Insurance@marsh.com • www.MarshAffinity.com Marsh is part of the family of MMC companies, including Kroll, Guy Carpenter, Mercer, and the Oliver Wyman Group (including Lippincott and NERA Economic Consulting). From the CEO 6	News William C. Parrish, Jr.
All of these challenges will take a concerted effort of our new president to provide a vision to the country that will bring out the best in our government, public, and private institutions to effectively solve. entirety. This is followed by a question-and-answer forum of both candidates in response to questions regarding their health care policy positions. It will quickly become evident that one candidate has significantly more information available regarding his health care policy platform. This is not to be construed as an endorsement of one candidate over another, but merely reflects what each campaign has made available at the present time. We urge each and every SCCMA member to read this information, and use it as a starting point to closely follow this important issue prior to the November 4 general election. Share your insights with your patients, colleagues, friends, and family. Your informed decision will decide the course of our nation’s health care future and it’s importance cannot be emphasized enough. unlisted procedures and you must submit a report in order for the insurance carrier to determine appropriate payment. (See more on billing unlisted procedures in the July/ August 2008 Bulletin.) QUESTION: A physician is seeing a patient in the office for a follow-up on a 90-day procedure and the patient has developed a seroma that he decides to treat in the office. This is not considered part of the surgical procedure recovery. What would we use for the modifier? ANSWER: If the service is not related to the original surgical procedure, then you would use a modifier 24 for the E&M code, if you perform a significant and separately identifiable service over and above what you would do for post-operative follow-up. The medical record must support the level of care provided to identify and determine treatment for the seroma. If the seroma is incised and drained, then the correct procedure code and modifier 79 must be used to reflect that it is unrelated to the original surgical procedure. QUESTION: When billing for three surgeons— one primary surgeon and two assistant surgeons—the second assistant surgeon is always denied as duplicate, even with separate dollar amounts and claims. Is this correct? ANSWER: If you are billing electronically, you may indicate in the comments field that this billing is for the second assistant surgeon. If billing on paper, you may submit a report indicating two assistant surgeons were used. If it is medically necessary to have two assistant surgeons for the procedure, and the second service is denied, you need to go through the redetermination process. Be sure to submit documentation to support the need for multiple assistant surgeons. QUESTION: Does the assistant surgeon maintain separate medical record documentation from the surgeon? ANSWER: The surgeon must describe the service provided by the assistant in the surgical operative report. You should obtain a copy from the surgeon for your records. Would you like to receive updated coding & reimbursement news by email? If so, please call the SCCMA office to provide your email address at: 408/998-8850 ext. 3007 or email: sandie@ sccma.org. You may also visit our website at: www.sccma.org. When someone asks me, “What’s organized medicine done for me lately?,” my response is quick, clear, and decisive – we waged a huge political fight with the federal government, and won! Then, we continued to fight to kill the President’s veto! Extends the Physician Quality Reporting Initiative for two years with a 2% bonus. Mental health service increase of 5% from July 1, 2008–2009. Teaching anesthesiologists receive 100% payment for concurrent cases in 2010. Extends the exceptions process for therapy caps through 2009. Allows independent labs to bill for pathology services provided to hospital patients–2009. Provides 2% bonus in 2009–2010 for physicians who electronically prescribe. Bonus is 1% in 2011–2012, 0.5% in 2013. Penalties for not e-prescribing: -1% in 2012, -1.5% in 2013, -2% in 2014 and beyond. Some exceptions apply. Provides an 18-month Medicare physician payment fix to give Congress time to develop and enact a long-term payment system reform. Requires physicians that furnish advanced diagnostic imaging services to meet Medicare accreditation standards by 2012. Retroactively stops the 10.6% payment cut effective July 1, 2008. Continues the 0.5% payment update through 2008. Stops the 5.4% payment cut effective January 1, 2009 and provides a 1.1% update. Extends the accommodation for physicians ordered to active duty in the armed services, so they can engage in substitute billing arrangements for >60 days. Because of the sustainable growth rate (SGR), physician cut in 2010 is 20%. Yet a Medicare Improvement Fund of $20 billion was established for use in 2014 for long-term payment reform. Delays the Durable Medical Equipment (DMEPOS) competitive bidding program for 18 months and replaces it with reduced payments for DME. Exempts physician suppliers of DMEPOS from DME accreditation. Many beneficiary improvements include coverage expansions for preventive services, cardiac and pulmonary rehabilitation, and benzodiazepines and barbiturates for Part D; an increase in the asset limit to qualify for the Part D (Prescription Drug) low-income subsidy and reductions in co-pays for mental health services to same level as other outpatient services (20%). Also allows the same Part B standard for offlabel drug coverage under Part D.
Primary care service increases of -1% (depending on the service, but including office and hospital visits) will begin in 2009 by applying the relative value unit (RVU) changes to the conversion factor, instead of the work relative values. Phases out duplicative Indirect Medical Education (IME) payments to health plans that the hospitals already receive ($7.5 billion in savings over five years; $200 million in California). Requires the Medicare Advantage Private Fee-for-Service (PFFS) plans to meet the same quality, marketing, and contracting requirements that all MA plans must meet. Establishes tough marketing regulation to end abuse in California. Eliminates the ability of PFFS plans to “deem” physicians contracted without a physician’s consent ($4.5 billion in savings over five years). the power of unity. This sends a message to all players that organized physicians are a force to be reckoned with for all future battles. “This big dog will fight, when you rattle his cage.” Let this victory be a rallying cry. Let’s keep this power rolling. Clearly, this could not have happened without an organized effort. Just imagine what we could do if we were bigger, stronger, together. As every physician benefited from our efforts, I think its time for them to get off the bench and join the game. Don’t you? Share the word, take your credit, and ask your non-member colleagues to join the fight. The future is in our hands. How do we want to play it? Your “cage” has been rattled way too much! It’s time to fight for your patients and your profession. The health of the nation depends on it! Unite. â&#x20AC;˘ Provide you with an early out program with a discounted rate for early payments? â&#x20AC;˘ Offer extensive skip tracing on your accounts? â&#x20AC;˘ Collect more than twice the national average and return more than double the amount other physicians receive? If you have never tried the BME, itâ&#x20AC;&#x2122;s time that you should. 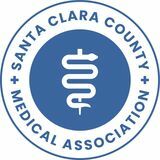 We are the only collection agency endorsed by the Santa Clara County Medical Association and have been for more than fifty years. Free Treatment Studies at Stanford • Treatment for Adults Aged 16 and Over for Anorexia • Treatment for Adolescents With Bulimia For further information, visit the website: www.edrcsv.org or contact Judy Beenhakker at 650/723-7885; email: judybeen@stanford.edu. John McCain believes we can and must provide access to health care for every American. He has proposed a comprehensive vision for achieving that. For too long, our nation’s leaders have talked about reforming health care. Now is the time to act. can deposit the remainder in expanded Health Savings Accounts. Americans are worried about health care costs. The problems with health care are well known: it is too expensive and 47 million people living in the United States lack health insurance. John McCain’s Vision for Health Care Reform John McCain believes the key to health care reform is to restore control to the patients themselves. We want a system of health care in which everyone can afford and acquire the treatment and preventative care they need. Health care should be available to all and not limited by where you work or how much you make. Families should be in charge of their health care dollars and have more control over care. John McCain will reform health care making it easier for individuals and families to obtain insurance. An important part of his plan is to use competition to improve the quality of health insurance with greater variety to match people’s needs, lower prices, and portability. Families should be able to purchase health insurance nationwide, across state lines. John McCain will reform the tax code to offer more choices beyond employer-based health insurance coverage. While still having the option of employer-based coverage, every family will receive a direct refundable tax credit —effectively cash—of $2,500 for individuals and $5,000 for families to offset the cost of insurance. Families will be able to choose the insurance provider that suits them best and the money would be sent directly to the insurance provider. John McCain proposes making insurance more portable. Americans need insurance that follows them from job to job. They want insurance that is still there if they retire early and does not change if they take a few years off to raise the kids. A Specific Plan of Action: Ensuring Care for Higher Risk Patients John McCain’s plan cares for the traditionally uninsurable. John McCain understands that those without prior group coverage and those with pre-existing conditions have the most difficulty on the individual market, and we need to make sure they get the highquality coverage they need. John McCain will work with states to establish a Guaranteed Access Plan. As President, John McCain will work with governors to develop a best practice model that states can follow—a Guaranteed Access Plan or GAP—that would reflect the best experience of the states to ensure these patients have access to health coverage. One approach would establish a nonprofit corporation that would contract with insurers to cover patients who have been denied insurance and could join with other state plans to enlarge pools and lower overhead costs. There would be reasonable limits on premiums, and assistance would be available for Americans below a certain income level. and different licensing schemes for providers. businesses from their employer mandate plans. importation of drugs and faster introduction of generic drugs. health care costs. We should dedicate more federal research to caring and curing chronic disease. COORDINATED CARE: Promoting coordinated care. provider accountable and responsive to the patients’ needs. in handling their programmatic responsibilities. allows doctors to practice across state lines. existing conditions would be denied insurance. some protection against exclusion of pre-existing conditions. coordination. Medicaid and Medicare should not pay for preventable medical errors or mismanagement. conditions are able to easily access care. Barack Obama’s Plan for a Healthy America: Lowering Health Care Costs and Ensuring Affordable, High-Quality Health Care for All The U.S. spends over $2 trillion on medical care every year, and offers the best medical technology in the world.1 Americans have their choice of top doctors and hospitals, and our national investment in scientific research has paid off handsomely. Diseases that were once life-threatening are now curable; conditions that once devastated are now treatable. Yet, the benefits of the American health care system come at a price that an increasing number of individuals and families, employers and employees, and public and private providers cannot afford. diseases, as well as new threats of pandemic flu and bioterrorism. particularly small businesses, to provide health insurance to their employees. hospital days, exposing families to unlimited financial liability. state efforts, and address its glaring weaknesses, such as affordability. compounded by serious flaws in our health care delivery system. (6) allow flexibility for state health reform plans. Guaranteed eligibility. No American will be turned away FROM ANY INSURANCE PLAN because of illness or pre-existing conditions. millions more are at risk of losing their coverage due to rising costs. training, and care coordination for appropriate individuals. Affordable premiums, co-pays, and deductibles. for deductibles for preventive services. for many with pre-existing conditions. affordable. They can use the subsidy to buy into the new public plan or purchase a private health care plan. Easy enrollment. The new public plan will be simple to enroll in and provide ready access to coverage. often not used well, and due to varying practices, it is often wasted. standards of the national plan. affordable for employers, workers, and their families. the care they need and to help providers improve medical practice. costs and improve health outcomes. improve quality of care and lower costs, as well. best diagnostic and treatment options for individual patients. decisions for their health and well-being. care as opposed to administrative costs. physician practice improvement to prevent future occurrences. relationship, and reduce the need for malpractice suits. are exploiting Americans by dramatically overcharging U.S.
developed countries, if the drugs are safe and prices are lower outside the U.S.
more appropriate drug utilization, and other efficiencies. keeping generics out of markets. Lowering Medicare prescription drug benefit costs. expand and reward these efforts. plans and pay them the same amount it would cost to treat the same patients under regular Medicare. the health of the American people. and limited access to real-time information and technical support. work, and play have real implications for their health and wellness. for both natural and man-made disasters. Americans to adopt healthy lifestyles. as Contributors to Bankruptcy,” Health Affairs, http://content. Obama will increase funding to expand community-based preventive interventions to help Americans make better choices to improve their health. and Canada.” New England Journal of Medicine. Disease Prevention. The Hamilton Project, Brookings Institution. Insurance Coverage Estimates,” March 23, 2007. http://www. must examine its own policies, including agricultural, educational, environmental, and health policies, to assess and improve their effect on public health in this nation. As President, Barack Obama will prioritize all of these activities, to ensure a 21st century public health system and healthy America. 1. CMS. (February 2007). National Health Expenditures, http:// www.cms.hhs.gov/NationalHealthExpendData/downloads/ proj2006.pdf 2. Census Bureau, “Census Bureau Revises 2004 and 2005 Health Insurance Coverage Estimates,” March 23, 2007. http://www. id=401577 19. Steffie Woolhandler, Terry Campbell, and David U. Himmelstein (2003) “Costs of Health Care Administration in the United States and Canada.” New England Journal of Medicine. 20. Elliott S. Fisher, David E. Wennberg, Therese A. Stukel, et al. “The Implications of Regional Variations in Medicare Spending. Litigation System to Improve the Quality of Care, http://aspe.hhs. Healthcare Research and Quality. Research in Action Issue 19. States Senate” (September 6, 2006). Testimony. Allowing Exclusivity,” Washington Post, http://www. We fight frivolous claims. We smash shady litigants. We over-prepare, and our lawyers do, too. We defend your good name. We face every claim like it’s the heavyweight championship. We don’t give up. We are not just your insurer. We are your legal defense army. We are The Doctors Company. The Doctors Company built its reputation on the aggressive defense of our memberphysicians’ good names and livelihoods. And we do it well: Over 80 percent of all malpractice cases against our members are won without a settlement or trial, and we win 87 percent of the cases that do go to court. So what do you get for your money? More than a fighting chance, for starters. To learn more about our professional liability program, call The Doctors Insurance Agency at (415) 506-3030 or (800) 553-9293. You can also visit us online at www.doctorsagency.com. © 2007. The Doctors Company. All rights reserved. 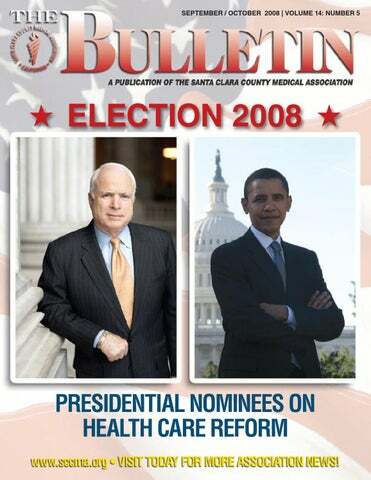 Presidential Nominees Respond to Ten Questions About Their Health Care Reform Proposals This Q&A appeared in the June 2008 issue of the ACCMA Bulletin. A key objective of the American Medical Association’s (AMA) “Voice for the Uninsured” campaign has been to bring national attention to the issue of the uninsured. The AMA is pleased that each of the leading 2008 presidential candidates have made health care a top priority in their respective campaigns. In response to a set of ten questions posed to the candidates about their health care reform proposals, listed below are the verbatim responses received from the campaigns of Senator John McCain (R-AZ) and Senator Barack Obama (D-IL). Disclaimer: The American Medical Association and Santa Clara County Medical Association do not endorse presidential candidates. Inclusion of the responses by the candidates to these questions is not intended to imply endorsement of nor opposition to any candidate, nor support for a specific candidate’s health care reform proposal. We have alternated the order of responses to avoid giving any special prominence to one candidate’s responses. How many Americans would have health care coverage under your proposal, and what are the total costs and sources of financing for your proposal? Senator Obama’s response: My plan will provide affordable, high-quality, and portable health insurance to all Americans, and ensure that all children, American citizens, and legal immigrants have coverage. My plan will cost approximately $50 – 65 billion per year, when fully phased in. I will ensure that this plan is revenue neutral by rolling back the Bush tax cuts for those earning above $250,000 per year and retaining the estate tax at its 2009 level, which has a $7 million exemption for couples. Senator McCain’s response: With the reforms that I am proposing, tens of millions of Americans who are currently uninsured would have access to coverage – which is a significant step toward making sure that all Americans ultimately have access to meaningful and affordable coverage. My plan is an approach to address the rising cost of care through competition, tort reform, a focus on preventative care, and reforms to Medicare payments. Accordingly, my plan will reduce costs to the federal government and the American taxpayer. including Medicare, Medicaid, SCHIP, and the new public plan. which providers serve patients must remain vigilant in their focus on quality, efficiency, and transparency. conditions, and charging all Americans fair and reasonable premiums. and encourage Americans to adopt healthy lifestyles. activities to strengthen prevention and public health. What is the role of public programs under your proposal, and how would you assure adequate payment levels within these programs to maintain sufficient patient access to care? coverage that is similar to the plan available to members of Congress. Presidential Nominees Respond, from page 25 measures. my reform permits the option of applying it to individual coverage. in the military or the public sector, Native Americans, and the poor. insurance would be higher, but the coverage would still be the same. higher bar of medical care quality. If your proposal incorporates the use of public subsidies, how are they designed or administered? Are they based on income, health status, employment status, or some other measure? that is right for them, allowing them to choose policies that would follow them from job-to-job. Moreover, I would allow non-traditional groups, including churches and professional organizations, to sponsor health insurance plans in which Americans could participate, irrespective of their employment status. What choice of benefit coverage options, including covered services, cost-sharing requirements, and premium levels, would be available under your proposal, and how would these decisions be made? health care plan or take an employer-sponsored health plan. childhood immunizations or a periodic physical exam for adults. that help people manage their chronic diseases. How would your proposal impact health insurance coverage portability, so that individuals would be able to maintain the same coverage regardless of factors such as employment status and geographic location? through which members of Congress get their own health care. level of benefits that equals those provided by my new public plan. What, if any, provisions are included in your proposal for changing the health insurance market, and how would they improve the market, especially for people with predictably high medical costs? costs in a competitive environment. What is the role of health information technology (HIT) under your proposal, and how would the purchase and maintenance of HIT tools be financed? health insurance is available to all Americans who seek it. to help ensure that unexpected or catastrophic illnesses do not price health insurance out of reach for businesses and their employees. catastrophic coverage will also reduce premiums. in rural and underserved areas. Is Your Photo in the Physician Membership Directory? Do You Need to Update Your Photo? mandatory. My plan will also implement initiatives to improve quality of care by accelerating efforts to develop and disseminate best practices, and aligning reimbursement with physician-validated outcome measures. Senator McCain’s response: Better HIT will enable quality reporting. By using the federal health programs as a catalyst, we will provide incentives to showcase effective and substantial quality reporting at the provider and regional levels. We will work with provider communities to establish a list of critical quality benchmarks and rapidly place incentives for their use. Email New Photos for the 2009 Directory to Pam Jensen at pjensen@sccma.org or call for an appointment to have your picture taken at no cost: 408/998-8850. COMING SOON! Now’s the time! Advertise in the 2009 Physician Membership Directory and Reach YOUR Target Audience! For details, contact Pam Jensen at 408/998-8850 or pjensen@sccma.org. Flame retardants migrate out of our textiles, foam, and electronics. PBDEs are often an additive to the product and do not stay in the product, but slowly give off gas for years. They are found in high concentrations in indoor environments including house dust, vacuum cleaner bags, and washing machine effluent. standards and Tris is one of many similar chemicals that could be used to meet standards for children’s toys and pillows. Brominated Flame Retardants Many flame retardants are brominated. Some of these brominated flame retardants (BFRs) are similar in structure to PCBs (polychlorinated biphenyls) and PBBs. All are persistent, bioaccumulate in living organisms, are highly mobile in the food chain, and are toxic. The most widely produced brominated flame retardants are decaBDE(decabromodiphenyl ether), TBBPA (tetrabromobisphenol A), and HBCD (hexabromocyclododecane). While decaBDE is used in electronics and TVs, pentaBDE (pentabromodiphenyl ether) has been the major product in furniture and cushions. Banned in Europe and the U.S. since 2004, pentaBDEs will continue to emanate from furniture and textiles for many years. Furthermore, decaBDE also appears to break down into lower more toxic forms, including pentaBDE. probable toxins. Reproductive and developmental neurotoxicity studies are to be completed by 2009. Firemaster 600 will replace Firemaster 550 in December 2008. Highest Levels of BFRs in Californians and Children Flame retardants migrate out of our textiles, foam, and electronics. PBDEs are often an additive to the product and do not stay in the product, but slowly give off gas for years. They are found in high concentrations in indoor environments including house dust, vacuum cleaner bags, and washing machine effluent. A 2003 study on BFRs in the blood of San Francisco Bay Area women from the 1960’s confirmed earlier studies showing a dramatic rise in BFR concentrations. Levels measured from samples from the 1990s reveal levels in California women to be 3 to 10 times higher than in Europe, in the same period. Stored samples from the 1960s showed no polybrominated diphenyl ether (PBDE) contamination present.2 Levels are steadily increasing. Scientists at the Cal EPA Department of Toxic Substances Control announced, in 2004, that they had found that California seabird eggs have by far the highest levels of PBDEs measured in wildlife in the world.3 Concentrations measured in children are the highest because they crawl on the floor and furniture and then ingest the dust from their hands or toys. Nursing babies are at the top of the food chain. A well publicized study of an Oakland family showed the highest levels measured of PBDEs.4 The toddler and infant studied had respectively 7 and 10 times higher levels of PBDEs than the parents. House dust contains PBDEs in significant amounts. The U.S. EPA estimates that children ingest on average 100 milligrams of house dust per day. The infant had a much higher level than the toddler or parents. This could be accounted for by breast feeding adding more PBDEs to the mix. Fire Retardants Appear Especially Toxic to Cats Scientists at the Environmental Protection Agency have noted a possible connection between thyroid disease and flame retardants. Hyperthyroidism has become increasingly common in older cats. Prior to 1980s, it was virtually unheard of. This rise in thyroid disease has paralleled the rise in brominated flame retardants in the environment and also the tissues of cats. Cats participating in the study had 23 to 100 times the levels of PBDEs than people in North America, who already have the highest levels measured. Dry cat food had significantly more PBDEs and those cats which consumed dry food had high levels of PBDEs.8 Cats also lick their fur and, thus, ingest more PBDEs through dust. Recycling and Brominated Flame Retardants Greening of ourselves and our planet considers that, ideally, everything we buy or consume can have another life, be recycled, or biodegrade into harmless substances. As flame retardants can be found in everything from computer casings, circuit boards, plastics, paints, paper, polystyrene, carpet backing, a variety of textiles, and foam cushions, an area of concern arises with production and disposal. No labeling is required to determine the identification of flame retardants used. How do we recycle products that have a toxic waste component? In this age of recycling, computer manufacturers are now concerned this will be a major problem as the flame retardants, when added to the plastic, render the casing not only unrecyclable, but also convert it to hazardous waste. Fire Risk Assessment California passed a stringent fire standards code, TB117, in 1980. Since then, levels of brominated flame retardants in California dust and breast milk have risen dramatically, compared to other states. Just because a retardant has been added to the product doesn’t mean it is not combustible. It is just less combustion able. With burning, the flame retardants release toxic dioxins and furans, as well. “There is no fire data to show that 28 years of TB117 has impacted fire deaths in Californians,” according to scientist Arlene Blum, a visiting scholar at U.C. Berkeley. In addition, cigarettes are considered the number-one cause of fire deaths in the U.S., about 600–800 per year. Fire-safe cigarettes have been implemented in 22 states, including California in 2007. Companies state they add speed bumps of extra layers of less porous paper. If unattended, the cigarette will self extinguish, instead of smoldering and possibly starting a fire. Deaths from cigarette related fires reduced by 33%, when New York’s law went into effect in 2004. The question then is where do we really need flame retardants and are there less toxic alternatives? Wool, for instance, is much less likely to burn than polyester. Mark Leno’s California Assembly Bill 706, if passed, will address some of these issues and begin using hazard assessment for moving to safer alternative chemicals. Brominated Flame Retardants, from page 31 Limiting Exposure Aside from avoiding products with flame retardants (i.e., polyurethane foam, TVs) in the home, these tips may help to reduce exposure: •	Keep house as dust-free as possible. •	Use a vacuum cleaner with hepa or other high efficiency filter. •	Keep house well ventilated. •	Cover mattresses with dust covers. •	Wash bedding regularly to control dust. •	Turn off electronics that are not in use. Standby mode maintains temperatures that can result in continuous offgassing. Ultimately, government regulation, both locally and on an international level, will be necessary to replace these poorly studied dangerous chemicals with safer alternatives that are properly studied prior to their use. Otherwise, we are just trading one danger for another that may have more catastrophic and global consequences. Green chemistry alternatives will be safer for our children, ourselves, and the environment. Health Perspectives, Vol. 111:1175-1179 (2003). 3. Press Release. California Scientists Find Highest PBDE Levels In Wildlife In San Francisco Bay Area Seabird Eggs. DTSC. Sept 9, 2004. 4. Fischer, D., et al. Children Show Highest Levels of Polybrominated Diphenyl Ethers in a California Family of Four: A Case Study. Environmental Health Perspectives 114:1581-1584 (2006). 5. Eriksson, P. et al. Brominated Flame Retardants: A Novel Class of Developmental Neurotoxicants in Our Environment? Environmental Health Perspectives 109:903-908 (2001). 6. Zhou,T., et al. Developmental Exposure to Brominated Diphenyl Ethers Results in Thyroid Hormone Disruption. Toxicological Sciences 66:105-116. 7. Ilonka, A., et al. Potent Competitive Interactions of Some Brominated Flame Retardants and Related Compounds With Human Transthyretin in Vitro. Toxicological Sciences 56: 95-104 (2000). 8. Dye, J. A., et al. EPA Study: Comparison of PBDE’s in Cat Serum to Levels in Cat Food: Evidence of Deca Debromination? Sept, 2007. 9. Birnbaum, L., Brominated Flame Retardants: Cause for Concern? Environmental Health Perspectives 112: 9-17 (2004). 10. Schecter, A., Polybrominated Diphenyl Ethers (PBDEs) in U.S. Mothers’ Milk. Environmental Health Perspectives. Vol. 111:17231729 (2003). Facing a $15.2 billion shortfall, Governor Schwarzenegger and legislative leaders have not yet reached agreement on the budget for the 2009 fiscal year, which began July 1. The fate of the 10% cuts to Medi-Cal reimbursement rates remains uncertain as legislators and the governor grapple with how to close the shortfall. This past month, the Assembly voted on the Assembly Democrats’ budget plan, which restored Medi-Cal rates to their levels prior to the cut, and reduced the budget shortfall with a mix of tax increases on corporations and wealthy individuals. The plan fell 9 votes short of the 54 votes needed under the 2/3 majority rule for legislative budget votes. It received no Republican votes. At the end of August, the Senate is expected to vote on a slightly different proposal. That plan could keep some portion of the 10% cuts to Medi-Cal reimbursement rates, but likely not all. The Senate plan is also expected to contain a mix of new revenues. It is not clear how or when the impasse will end. While both parties generally want to avoid cuts, they disagree on how or whether to raise new revenues to deal with the shortfall. Some Republicans may eventually agree to targeted tax increases, but will likely insist on a mandatory budget cap in return, which is generally opposed by Democrats. Until these issues are largely resolved, we will remain without a budget. What is clear is that cutting health care remains an option for a legislature under increasing pressure to resolve a huge budget shortfall. CMA urges you to contact your legislator and ask them to commit to passing a budget which doesn’t cut health care. You can find your legislator by typing in your address at the legislature’s website: http://192.234.213.69/ lmapsearch/ framepage.asp. Contact: Ned Wigglesworth, 916/444-5532 or nwigglesworth@cmanet.org. union trusts, or even other health plans. These “silent PPOs” allow the third-party payors to take advantage of discounted rates that health plans have negotiated with their contracted physicians. Health plans make a great deal of money, sometimes as much as $4 per subscriber per month, leasing physician networks. Health plans often conceal silent PPO clauses in lengthy contracts and use language that applies in perpetuity. leasing. The guide will help physician practices to detect and prevent silent PPO activity. The silent PPO action guide is available through CMA ON-CALL (document #1907). ON-CALL documents are available free to members at CMA’s members-only website: www.cmanet.org/member. Contact: Samantha Pellon, 916/551-2872 or spellon@cmanet.org. ADS office space for rent/lease MEDICAL OFFICE SPACE FOR LEASE • East San Jose 1,380 sq. ft. excellent medical suite across from Regional Medical Center. Available October 2008. First floor, with lab and xray suites in the building to make it convenient for your patients. Lots of parking available. Great visibility at corner of N. Jackson and Montpelier Dr., located at 244 N. Jackson Ave. Call Tania at 408/923-0257. MEDICAL SUITES • WEST SAN JOSE/ CAMPBELL/LOS GATOS Medical Art Suites. 1,595 sq. ft. and 2,705 sq. ft. designed for 5+ treatment rooms, bathroom, and elegant reception area. Tenant improvement allowances. Minutes from hospitals and Hwys. 85 & 17/880. Excellent visibility. Located at 2242 Camden Ave. (Bascom Ave.), San Jose. Call 408/3777383. MEDICAL OFFICE FOR LEASE/ SUBLEASE Office in close proximity to O’Connor Hospital for lease/sublease. Please call 408/923-8098 for more information. Medical space available in medical building. Most rooms have water and waste. Reception, exam rooms, office, and lab. X-ray available in building. Billing available. 2,500–4,000 sq. ft. Call Rick at 408/2280454. 2,048 sq. ft. ready to occupy medical office, previously occupied by RAMBLC Pediatric Group. Located at 6140 Camino Verde Dr, San Jose, in the Santa Teresa Medical/ Professional Center across from Kaiser Hospital. Call Virginia at 408/528-0571. PROPERTY MANAGEMENT & LEASING BAYSIDE REALTY PARTNERS specializes in the property management and leasing of medical office buildings in the Bay Area, resulting in superior results for our clients. Should you wish to receive a free assessment of your property and a proposal, please contact Trask Leonard, CEO, at 650/282-4620, or tleonard@baysiderp.com. PRIVATE PRACTICE FOR SALE Established/Active Internal Medicine/ Primary care practice for sale. Work/live in Coastal California. Enjoy best of everything. If interested, please call 831/345-9696. BRAND NEW HIGH END MEDICAL CONDOS–DOWNTOWN LOS GATOS Design/build-to-suit opportunities for sale/lease. On-site parking. In the heart of prestigious downtown Los Gatos. Unit sizes 1,400 sq. ft. and up. Contact Matt–408/282-3835. www. colliersparrish.com/losgatos. positions at the San Jose Military Entrance Processing Station, 546 Vernon Ave. Mountain View. Medical Practitioners will conduct medical qualifications examinations of applicants for all branches of Armed Forces. Must hold a current unrestricted license. Practitioners will be subject to credentials approval by the Headquarters U.S. Military Entrance Processing Command prior to employment. Excellent opportunity for someone looking for a flexible, part-time work schedule from 1-2 days per week to as little as a few hours per month. If you are searching for this unique opportunity, contact Ms. Veronica Knight at 650/603-8236 to become part of our team. FAMILY PHYSICIAN NEEDED MD or DO wanted. F/P in Santa Clara. Phone: 408/515-2222; Fax: 408/556-6773. FAMILY MEDICINE PHYSICIAN NEEDED Part- or full-time physician sought to join existing practice. Currently, we have two full-time MDs and one part-time MD. Busy PPO-only practice. Very light call schedule, approx. one weekend in 17. Hospital work by choice only, close to Good Samaritan Hospital. Employee or expense sharing are options. If interested or for further details, please fax your information to 408/3589028. Upon reviewing your resume, we will call you. condo/COTTAGE rentals CHRISTMAS/NEW YEAR • NORTH SHORE LAKE TAHOE Front lake, three bedroom, two & half bath townhouse. Sleeps eight. Linen, internet, year-round pool. $400 per night. Call Christiane at 408/356-7453. COTTAGE FOR RENT • SARATOGA Cottage in Saratoga. Retreat-like setting. Close to great hiking and biking trails. Close to Hwy 85. One large bedroom, living room, kitchen, and bath. Private driveway and fenced yard. Rent $1,290 per month. Available mid-August. Contact Carolyn Silberman 408/867-1815, or cell 408/2217821, or email wwswolfe@aol.com. On June 18, 2008, Carolyn Miller was installed as President of the Santa Clara County Medical Association Alliance, for a second term, at an installation luncheon held in Heather Goodmanâ&#x20AC;&#x2122;s lovely Saratoga home. Debbi Ricks, CMA Alliance President, installed Carolyn and her new board, Mary Hayashi, President-elect, Kathleen Miller, Membership Chair, Siggie Stillman, Treasurer, and Meg Giberson, Legislation. Special thanks go to Heather for hosting this delightful event. Special thanks go to Dr. Stephen and Suzanne Jackson for hosting a funfilled afternoon in their lovely back yard. Everyone enjoyed the games, ice cream, and a chance just to get together on a warm summer afternoon. Thanks also go to Kathleen Miller and her husband, Dr. Craig Thomas, for organizing all of the details for the event, and to Wayne Miller, photographer. How Would You Treat A Patient After a Cryptogenic Stroke? communication with you, the referring physician. safe. Patients are typically discharged within 24 hours and are back to work the same week. California Pacificâ&#x20AC;&#x2122;s Heart and Vascular Center offers quality, comprehensive, patient-centered cardiovascular care by a team of pioneering physicians integrating leading-edge technology. It’s Good to Have Endorsements in an Election Year The Santa Clara County Medical Association and 27 other California medical societies endorse NORCAL as the professional liability insurer for their members. That’s because they know that 9 out of 10 claims NORCALprocessed last year were closed without indemnity payments. They also know NORCAL has returned $358 million in dividends to our policyholder owners since 1975. Visit www.norcalmutual.com today, or call 800.652.1051. NORCAL. Your commitment deserves nothing less.